EK Water Blocks (EKWB) is named after the founder of the company, Edvard König, who began his liquid cooling journey way back in 1999. At this time, he was one of the only people in the world doing this work, a true pioneer of the industry. Starting from humble beginnings in Slovenia, EKWB has emerged as the leading liquid cooling manufacturer in the world. Read more about the company here! Mark Tanko, CEO of EKWB, admits a great influence of becoming as popular as they are is by providing products and tools that are tailored both to beginners and advanced builders. Community engagement and customer service (in several forms) is what Andrej Skraba, Head of Marketing, says are two of their many keys to success. Positioning the company as one who provides quality products is not enough to succeed on the level they want so they also much provide the tools and customer support to help their buyers succeed in their work as well. This is evidenced by the countless helpful videos, guides, and other tools used to assist buyers to use their products to the best of their ability. Niko Tavadar, CTO, admits the company employs several types of engineers to make sure the products are the best in the industry. With quality as the main focus of building their brand, each product is designed carefully and tested thoroughly by several engineers to ensure EKWB products are helping builders to make the most efficient machines possible. 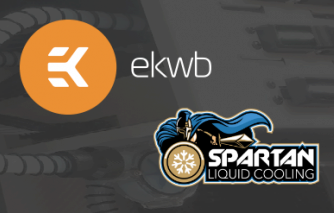 For all of these reasons, Spartan Liquid Cooling has chosen to partner with EKWB to distribute their products to builders around the US and abroad. Click here to view our latest products including CPU Water Blocks, Hard Tubing Fittings, Plug Fittings and much more. Contact us today with any questions or to place an order now!